23-6-42. 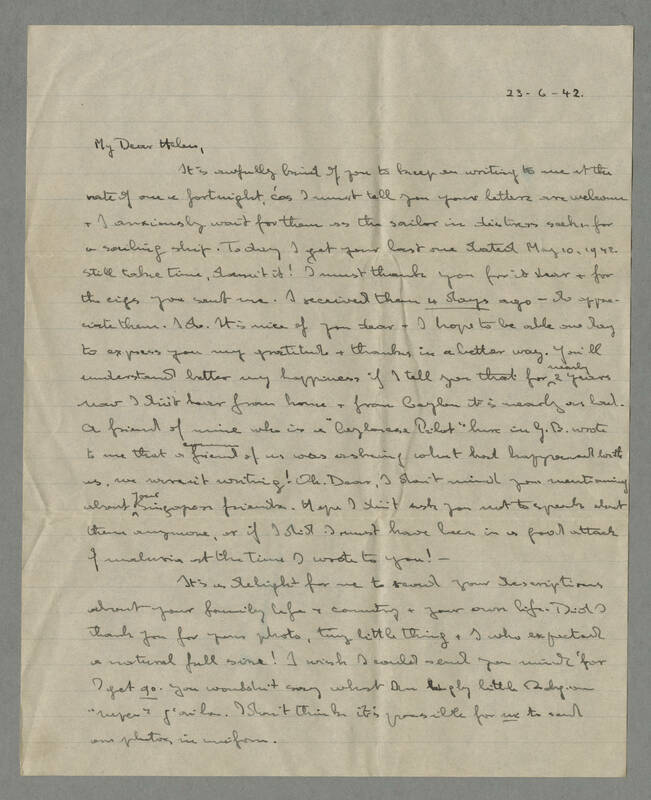 My Dear Helen, It's awfully kind of you to keep on writing to me at the rate of one a fortnight, 'cos I must tell you your letters are welcome & I anxiously wait for them as the sailor in distress seeks for a sailing ship. Today I got your last one dated May 10, 1942. Still [takes?] time, doesn't it! I must thank you for it dear & for the cigs you sent us. I received them 4 days ago---do appreciate them. I do. It is nice of you dear - I hope to be able one day to express you my gratitude & thanks in a better way. You'll understand better my happiness if I tell you that for nearly 2 years now I didn't hear from home & from Ceylon it's nearly as bad. A friend of mine who is a "Ceylonese Pilot" here in G.B. wrote to me that a [common?] friend of us was asking what had happened with us, we weren't writing! Oh, Dear, I shan't mind you mentioning about your Singapore friends. Hope I didn't ask you not to speak about them anymore, or if I did I must have been in a good attack of malaria at the time I wrote to you! - It's a delight for us to read your descriptions about your family life & country & your own life. Did I thank you for your photo, tiny little thing & I who expected a [natural?] full size! I wish I could send you [illegible] for I get 90. You wouldn't say what [illegible] little [illegible]. I shan't thank it's possible for me to send our photos in uniform.